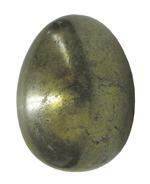 Item #EC-196: 2.7" tall Chalcopyrite Sphere. 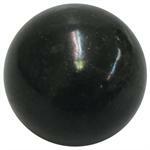 Item #AM-AGSP-561: 46-56mm diameter Apache Gold (Chalcopyrite in Black Schist) Sphere (Arizona, USA). Item #GSE-474: 60mm diameter golden Chalcopyrite Sphere (Chile) with Black veining; 1.05 lbs.